One of the non-optional extras you’ll get if you cough up £101,900 for a Tesla Roaster Sport electric car is, it seems, a constant reminder that you’ve purchased a fledgling product. 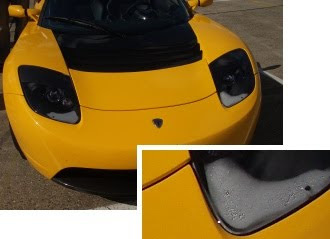 If you want a quality fit and finish, buy a Porsche, as the steamed-up headlamps of this yellow Tesla attest. We were tempted to write that spending 100 grand with Tesla bought you build quality on a par with a Reva G-Wiz, but that’s unfair. We doubt that condensation is a G-Wiz issue – there are too many big ventilation gaps. The last car we can recall that suffered such a marked misting of the eyes was actually in the same rarefied price bracket as the tiny Tesla - the 1990s Aston Martin DB7 had headlamps that were equally prone to cataracts. The complaint, along with sundry other issues that arise with a low-volume car, never harmed Aston – such is the magical value of its brand – and it seems likely that Tesla’s early adopters will be similarly inclined to turn a blind eye to such fiddling faults.